One of the challenges with stop motion animation is flicker. Lighting varies slightly for any number of reasons causing the exposure of every frame to be slightly different. We were pretty excited when Bix Pix Entertainment bought a bunch of Flicker Free licenses (our deflicker plugin) for Adobe After Effects. They do an amazing kids show for Amazon called Tumble Leaf that’s all stop motion animation. It’s won multiple awards, including an Emmy for best animated preschool show. So we love stop motion animation. And Bix Pix does an absolutely stellar job with Tumble Leaf. The animation, the detailed set design, the characters… are all off the charts. I’ll let them tell it in their own words (below). But check out the 30 second deflicker example below (view at full screen as the Vimeo compression makes the flicker hard to see). I’ve also embedded their ‘Behind The Scenes’ video at the end of the article. If you like stop motion, you’ll really love the ‘Behind the Scenes’. 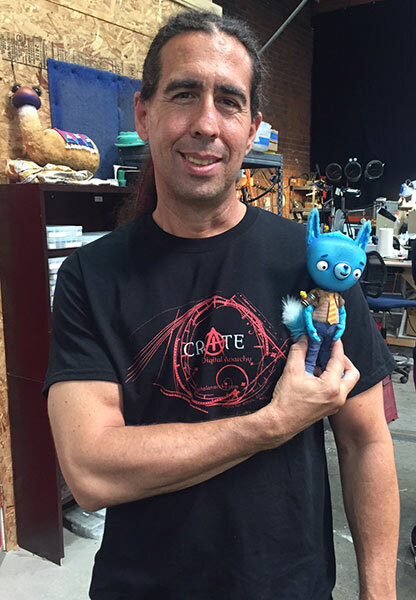 Bix Pix Entertainment is an animation studio that specializes in the art of stop-motion animation, and is known for their award-winning show Tumble Leaf on Amazon Prime. It is not uncommon for an animator to labor for days sometimes weeks on a single stop motion shot, working frame by frame. With this process, it is natural to have some light variations between each exposure, commonly referred to as ‘flicker’ – There are many factors that can cause the shift in lighting. For instance, a studio light or lights may blow out or solar flare. Voltage and/ power surges can brighten or dim lights over a long shot. Certain types of lights, poor lighting equipment, camera malfunctions or incorrect camera settings. Sometimes an animator might wear a white t-shirt unintentionally adding fill to the shot or accidentally standing in front of a light casting a shadow from his or her body. The variables are endless. Luckily these days compositors and VFX artists have fantastic tools to help remove these unwanted light shifts. Removing unwanted light shifts and flicker is a very important and necessary first step when working with stop-motion footage. Unless by chance it’s an artistic decision to leave that tell-tale flicker in there. But that is a rare decision that does not come about often. Here at Bix Pix we use Adobe After Effects for all of our compositing and clean-up work. Having used 4 different flicker removal plugins over the years, we have to say Digital Anarchy’s flicker Free is the fastest, easiest and most effective flicker removal software we have come across. And also quite affordable. During a season of Tumble Leaf we will process between 1600 and 2000 shots averaging between 3 seconds and up to a couple minutes in length. That is an average of about 5 hours of footage per season, almost three times the length of a feature film. With a tight schedule of less than a year and a small team of ten or so VFX artists and compositors. Nearly every shot has an instance of flicker free applied to it as an effect. The plugin is so fast, simple to use and reliable. De-flickering can be done in almost real time. Digital Anarchy’s Flicker free has saved us thousands of hours of work and reduced overtime and crunch time delays. This not only saves money but frees up artists to do more elaborate effects that we could not do before due to time constraints, allowing them to focus on making their work stand out even more. If you are shooting stop-motion animation and require flicker free footage, this is the plugin to use. For a breakdown of how they do Tumble Leaf, you should definitely check out the Behind the Scenes video!